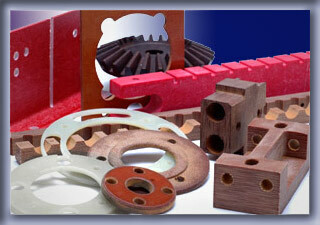 We specialize in rapid turn around for machined parts, usually within one day. We saw, drill, mill and turn all types of plastics. Send us your drawing, sketch or part. Do you need a flexible supplier? Stop in and let us discuss your requirements or fill out our "Contact Us" or "Request For Quote" form on-line and we will help you formulate a design that fits your needs. We have provided examples in photo of pieces we have made in plastics and Plexiglas for our clients. Our experienced staff knows how to best machine these materials and have the tooling necessary to best machine the part while maintaining material integrity. 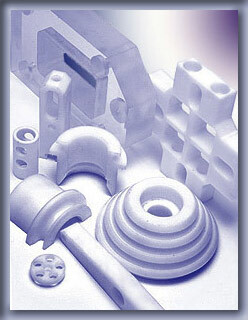 Angus-Campbell can fabricate plastic replacement parts using existing plastic parts as a guide. This provides maintenance repair operations (M.R.O.) customers with a highly cost effective alternative to OEM replacement parts. We machine from either prints or samples and utilize the best in automatic and manual machinery, maintained to provide the close tolerances required by our customers. Our machine operators are highly skilled workers, knowledgeable in both machine capabilities and material characteristics. Examples displayed are one of a kind parts for machines that have been discontinued and for which replacement parts are unavailable. We also create prototypes for new machinery for our customers as required. Angus-Campbell, Inc. has the right skills and equipment. 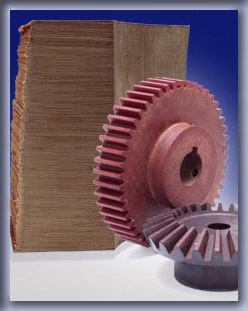 A part may require both milling and hand routing. Typically, shops are not equipped with the skills and equipment from both trades. Angus-Campbell, Inc. is equipped and therefore uniquely qualified to handle your most demanding projects. Projects such as the gears shown in picture at right might require subcontracting final machining, but we will work with you from concept to completion. Many of our customers have been with for us for many years. They return because we provide innovative ideas and cost effective solutions, consistent quality and prompt, reliable service. You will find that you can rely on Angus-Campbell, Inc. for your custom fabrication needs. Download this form and fax or mail to us for a quote.